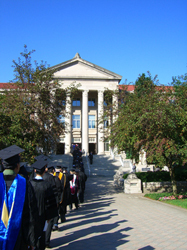 The mission of the Department of Statistics at Purdue University is to advance the frontiers of statistical science research in both theory and applications; to provide learning environments that produce well educated statisticians, probabilists and quantitatively literate people; to join with others in bringing the strengths of the statistical sciences to address societal needs. Purdue Statistics offers the degrees of Bachelor of Science, Graduate Certificate, Master of Science and Ph.D. in Statistics. Currently we have 229 undergraduate majors in Statistics and Actuarial Science, 98 graduate students working towards their degrees and another 19 working towards a Graduate Certificate. The strength of Purdue Statistics is built on a solid foundation of theory and probability from which excellence in interdisciplinary applications has grown. The department has acknowledged the increasing importance of statistics as a multidisciplinary science and has benefited greatly from departmental faculty hires with shared appointments in Agronomy, Biology, Computer Science, Earth and Atmospheric Sciences, Electrical and Computer Engineering, Forestry and Natural Resources, and Mathematics. Formed in 1963 as part of what was then the Division of Mathematical Sciences, and later becoming an independent entity within the College of Science in 1968, Purdue's Department of Statistics (graduate program) ranks in the top 10 of statistics graduate programs (as reported in U.S. News & World Report's America's Best Graduate Schools, 2009 issue). As Purdue University's College of Science continues its work in cutting-edge research, learning, and engagement with distinguished faculty, students, and programs, the Department of Statistics leads the way as the most highly ranked department in the College of Science. For more than 40 years, important discovery and meaningful learning have defined the department's contribution to the College, Purdue, and the world! Purdue Statistics continues to provide students with the skills and experiences they will need to make a difference in our world. Our faculty continue to push the educational and research boundaries while remaining ever mindful that Purdue Statistics is launching tomorrow's leaders.